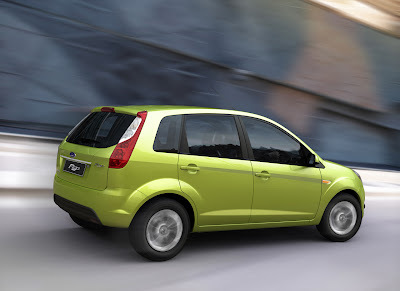 Ford is introducing a neat little car for the rapidly expanding Indian market: The Ford Figo. Nearly 70% of cars sold in India are the B-segment vehicles (aka subcompacts), and Ford has put some serious cash—$500 million—into updating its Chennai plant, which will build the Figo. Ford is obviously committed to expanding its market share in India, which is currently being served by the Fiesta, Ikon, Fusion (not the U.S. Fusion, but a little SUV), and the Endeavor. Looks like a reskinned old-model Fiesta hatchback.